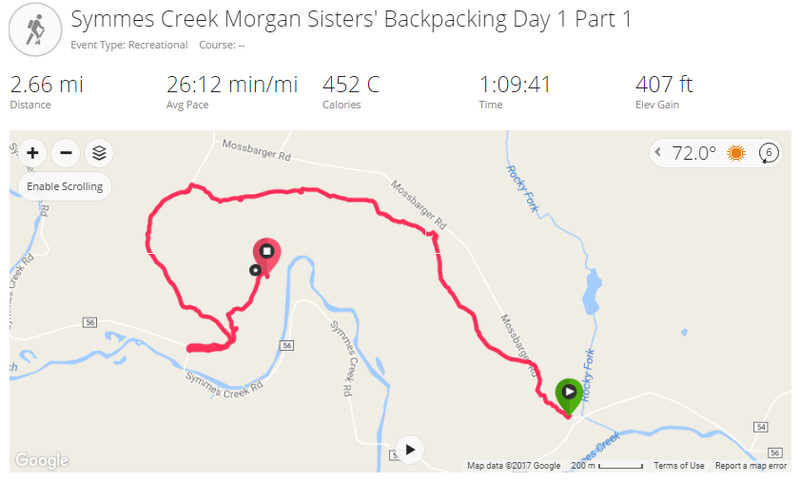 Symmes Creek & Morgan Sisters is actually a combination of two different trails with four separate loops that interconnect. 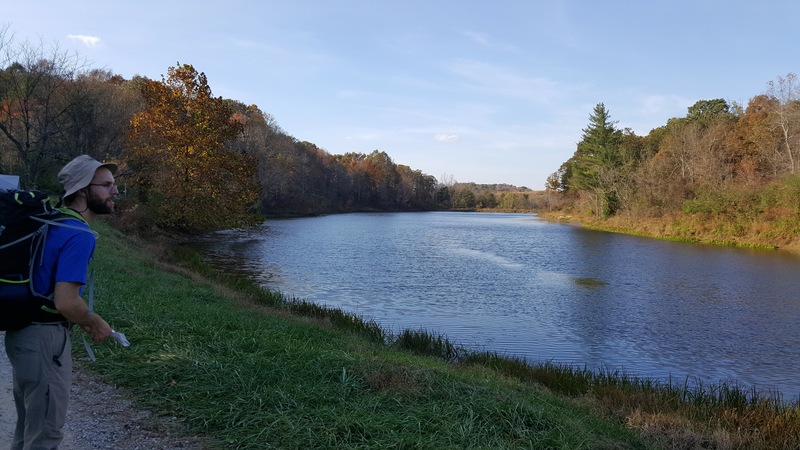 It is located in Southern Ohio near the town of Rio Grande. 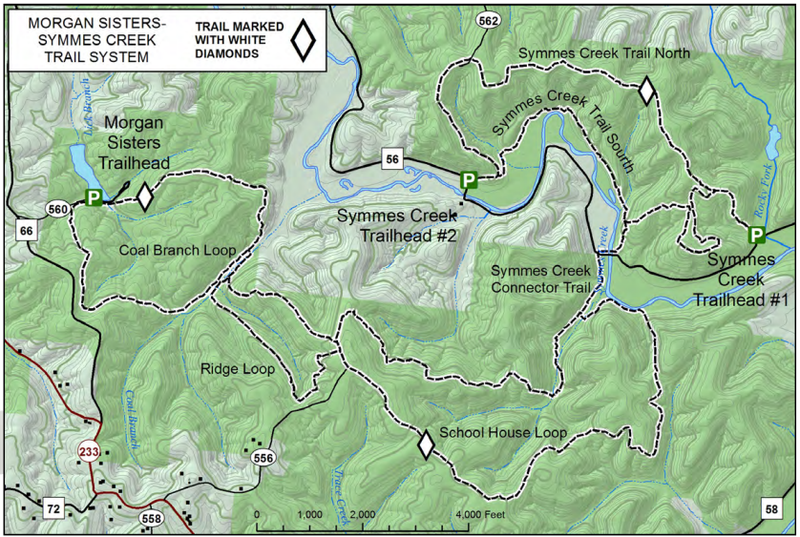 Because of the different loops, there are multiple options for distance as well as trail heads. To do all of the trail is just over 14 miles. Kevin and I have both been battling nagging knee injuries. So we decided to make this trip just an overnighter. It was late October 2016 and we were prepared for cold weather. The trail provided multiple options for distance should either of us find ourselves in too much pain to continue. We met early Saturday morning at Kevin’s house and drove the hour and a half down to the trail head. The trail head is off of a non-descript gravel road in the middle of nowhere. We were the only vehicle there, but there was evidence that locals use the trail head parking lot often as a bonfire/drinking spot. There were also ATV/4-Wheeler tracks setting out in all different directions from the trail head even though they are illegal in this area of Wayne National Forest. 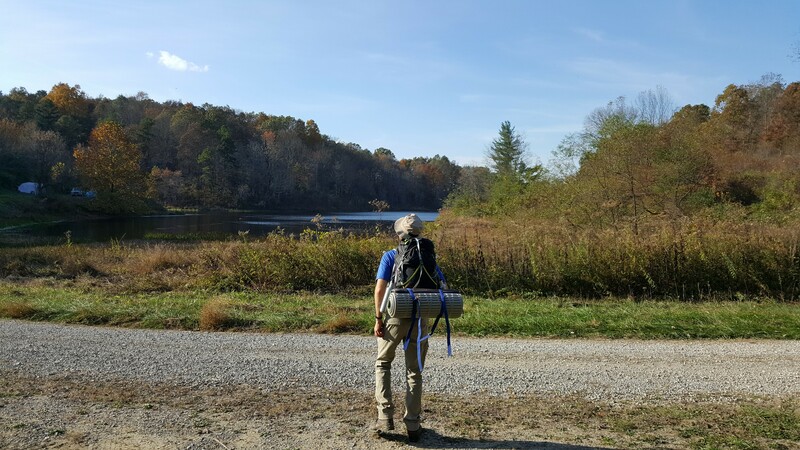 We grabbed our gear and quickly set out on the trail. We noticed very quickly that this would be a challenging trail. The trail immediately started with a steep climb up a hill with the trail badly washed out and rutted from the illegal 4-wheeling. This was my third attempt to complete this trail. Twice before I had taken friends that were new to backpacking on this trail and had been rained out. So I had only completed the first loop. I was hoping this adventure would be different. Despite the poor trail conditions, Kevin and I made good time. We reached some caves by lunch time and decided to take a break. I was starting to develop some blisters (I’ve been away from hiking too long!) and we were both hungry. After a quick bite and me putting on two pairs of socks, we set off again. We quickly made it to the connector trail that led from Symmes Creek trail to the School House loop. This was officially new trail for me. Despite it being late fall (and us having packed for cold) we found ourselves sweating in 77 degree weather. 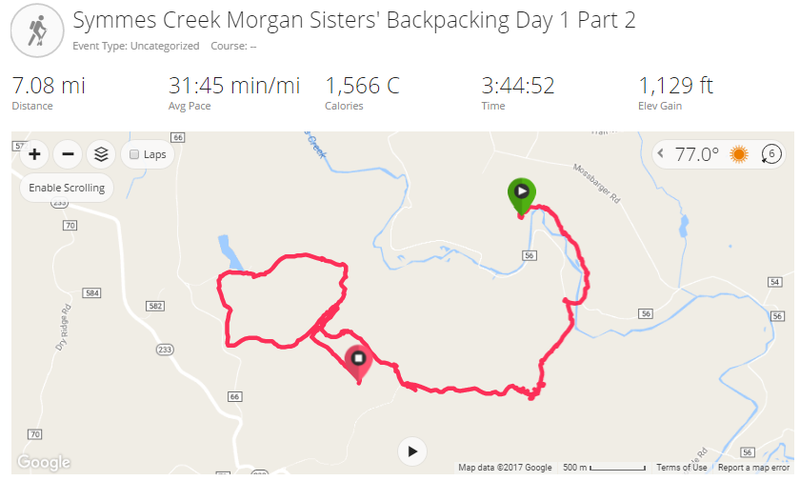 The second half of the hike had even more elevation change and was very difficult. The autumn leaves covered the ground and the seldom used hiking path was very difficult to see. We lost the trail multiple times and found ourselves trailblazing through thorns. Furthermore, the crisscrossing ATV paths often made us question our bearings and more than once we accidentally followed an incorrect offshoot. 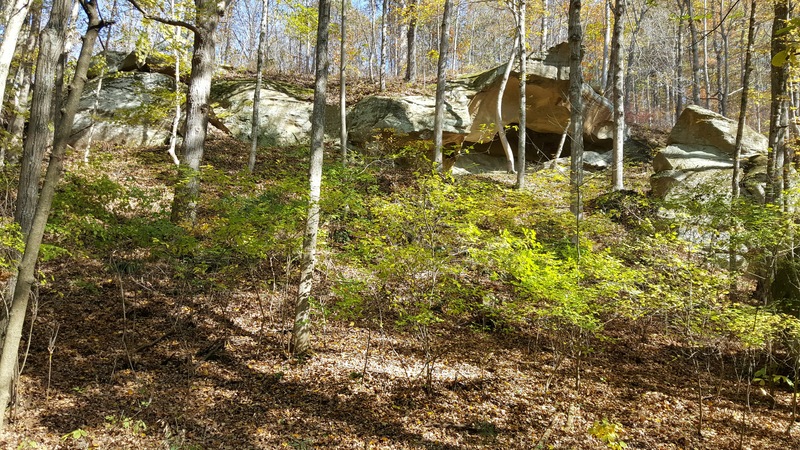 We followed the North section of the School House Loop to the North section of the Ridge Loop and finally to the Coal Branch Loop. We stopped to admire a beautiful lake as a family was setting up tents along the shore. 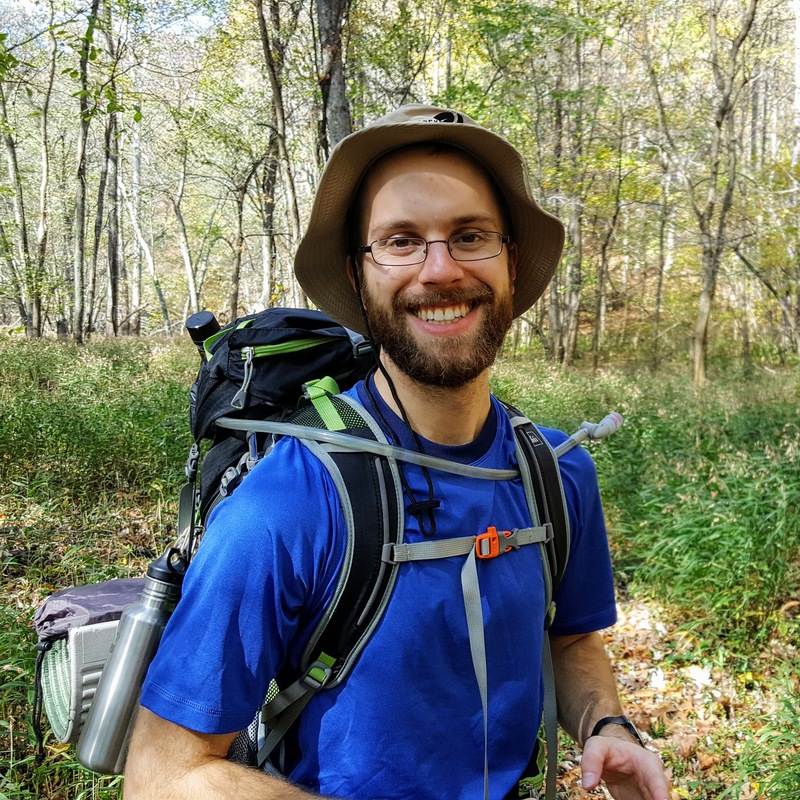 It was clear that few people used the Coal Branch Loop trail and we soon found out why. It started with a steep 500+ foot climb with no switchbacks. After completing this loop we were exhausted (especially after climbing back to the top of the South section of the Ridge Loop). So we found a nice flat spot on top of the ridge with massive ravines on either side of us. We cleared the sticks and leaves away and setup camp. While clearing the site Kevin found a large machete buried in the leaves (luckily he noticed it before his foot found it). We quickly set about coming up with creepy stories about how the machete came to be there. That night we had a lovely fire and enjoyed the unusually warm night as we stayed up talking. The next morning we had a leisurely breakfast in camp. Although, we did use the little water we had left to make coffee. We underestimated the amount of water that we would need due to the warm weather (lots of sweating). Luckily, we eventually crossed Symmes Creek again and were able to filter and refill some of our water bottles. Throughout the morning, we continually lost the trail. It was covered in leaves and we could not find regular blazes. The main trail was crisscrossed with ATV trails, hunting trails, and logging roads. When we found ourselves a mile down an ATV trail and clearly no longer on the main path, we were both nursing painful knees and unwilling to hike all the way back to try to find the trail. Instead, we followed the ATV path out to Symmes Creek road and just walked the road back to the trail head. The trail was challenging and beautiful. Had it been blazed better it would not have been as difficult to follow. We lost too much time trying to figure out where the trail was supposed to go and following offshoots. 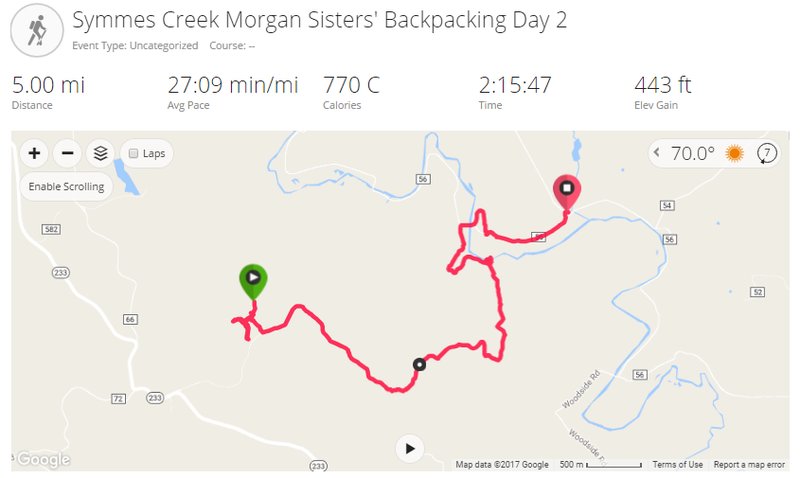 I would not recommend this trail to beginners, but for experienced hikers willing to do some navigation, it is beautiful.